The solid results are strong proof of Hong Kong’s R&D capabilities in the biotech sector. 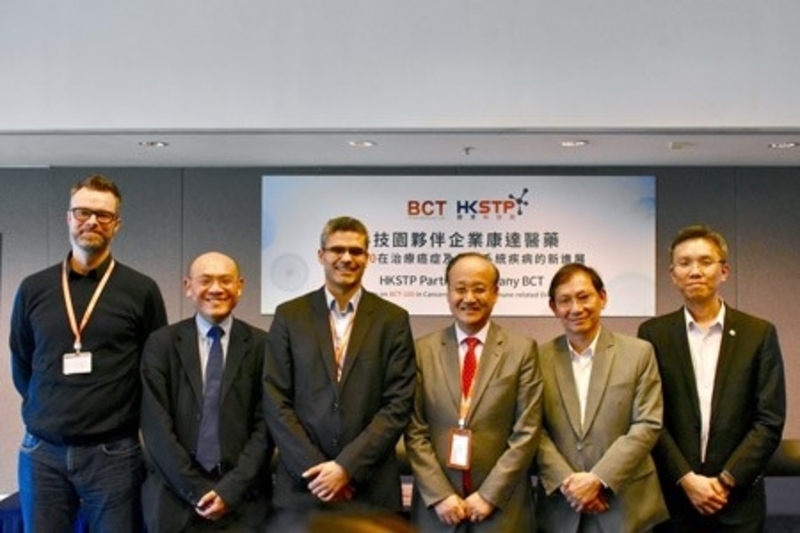 According to a recent press release, an HKSTP partner company, shared the latest progress of the company’s innovative biological drug, BCT-100, which is aimed at treating cancer. Beyond the positive results seen for cancer treatment, the drug has also shown immunosuppressive properties that can be used to treat autoimmune diseases such as rheumatoid arthritis. These results from BCT marked a milestone for the biotech industry in Hong Kong. The drug was the first Hong Kong-developed innovative drug approved for clinical trials by the US Food and Drug Administration (FDA). BCT-100 targets arginine auxotrophic cancers, such as acute myeloid leukaemia, melanoma, hepatocellular carcinoma and prostate cancer. BCT has already confirmed the PK/PD and safety of BCT-100 in the US clinical study, and the company is now recruiting more cases for the phase I extension to confirm drug efficacy in melanoma. Phase I of the study saw a substantial number of stable diseases among prostate cancer patients. The team is also actively verifying the application of a proprietary biomarker panel, which can help identify other cancer patients who can benefit the most from BCT-100 treatment. The eligible patient population is expected to be expanded by multiple folds soon. Once the phase I extension study is completed by Q4, the firm will move on to a multi-centre phase IIb/III in the US. While in Hong Kong, the firm will seek a listing on the Stock Exchange of Hong Kong as a pre-revenue biotech company and are actively planning on such a public offering in 2020. Overseas studies from several reputed universities have presented new data that showed that the drug is also effective in treating autoimmune diseases. BCT joined Hong Kong Science Park in 2007. With its decade-long history in biopharmaceutical R&D, as well as advanced laboratory facilities and support services, BCT successfully developed a drug candidate in active phase II clinical trials and received support from renowned venture funds. The Chief Technology Officer of HKSTP noted that the Park and its members and leadership are all happy to see new progress in BCT’s R&D work. Biomedical technology is one of the Park’s fastest growing clusters with 115 partner companies and incubatees based in Hong Kong Science Park. HKSTP is committed to contributing to their success by providing comprehensive R&D infrastructure and support services to accelerate translational research and commercialization. The hope is to see more advanced biotech companies join the HKSTP ecosystem to help build a better future for the biotech industry in Hong Kong. As far as Hong Kong’s Smart City initiatives go, the HKSAR Government has stated that one of its missions is to make people happier, healthier, smarter and more prosperous, and the city greener, cleaner, more livable, sustainable, resilient and competitive. Moreover, the HKSAR leadership aims to promote healthy living and ageing in different settings, including hospitals, care homes and ultimately in the community. The Government seeks to enable research, like BCT-100. through by facilitating healthcare-related research in 2019 and start adopting a smart hospital approach. By 2020 it is hoped that the use of an automatic system interface with vital sign devices or hospital navigation applications will be piloted in new hospital projects. The work by the HKSTP partner company will help realise the Smart City goal of enabling citizens to enjoy healthcare services supported by new technology applications.